Author of Heaven Is Beautiful: How Dying Taught Me That Death Is Just The Beginning, TV talent, producer, writer & Reverend. A working mother hunted for boots that her teenage daughter wanted for Christmas. She looked for weeks hoping to find the expensive boots. An emergency car repair bill came up, meaning the mother spent the boot money. She still hoped to find the boots and put them on layaway. Her daughter would be happy if she got a promise of the boots under the tree. The mother drove downtown and found a parking spot in front of Reny's. Holding the door for an elderly man with shoulder length white hair, she went downstairs and found the boots in the right size and color. At the register she asked to put them on layaway. The clerk responded that, "If they are for Christmas, they'll have to be picked up by the 15th." The mother said, "But that's Monday!" adding, "Put 'em on layaway anyway, they're what my daughter wants and somehow I'll pay by Monday." She was reaching inside her purse when a man handed his credit card to the clerk, saying, "Put those boots on my card. I am buying them for this lady." The mother said, "They cost $125.00, you can't buy 'em for me." The white-haired gent said, "I've had a good year, and I'm doing this for your child, Merry Christmas." He signed the receipt and left the store. Reny's wishes the gentleman to remain anonymous. 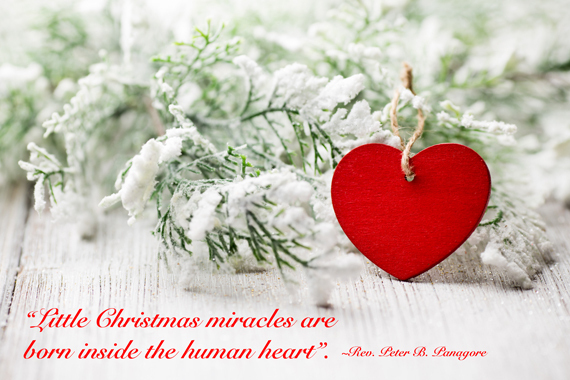 Little Christmas miracles are born from inside human hearts.